So those who follow this blog on Facebook know that at about 4pm yesterday afternoon I had absolutely no idea what I wanted to make for dinner last night. So I came home and dug into my magazines and cookbooks and pulled out recipe that fit exactly the criteria I was looking for: few ingredients, little cost, and quick to pull together. The result was “spaghetti alla cacio e pepe”, or spaghetti with pecorino romano and black pepper–a recipe that always looked so classy that I had just never gotten around to trying. Finding the pecorino romano in their cheese section was easy, as I knew it would be, and then I got this crazy idea that an Italian grocery like this would have fresh pasta instead of the typical dried pasta that 99% of us eat. I’ve certainly never eaten fresh pasta before, so what better time to try it than a time when quality ingredients count? Bonus: Walked out with a receipt for just $7, despite the fancy stuff I just purchased. I’ve painted a rosy picture here, but truthfully, I was at the market and panicking because the recipe calls for 3 ounces of cheese and the cheese was only labeled in pounds not ounces, then I realized that the recipe calls for 6 ounces of pasta and, not only is the pasta also labeled in pounds, but fresh pasta certainly weighs more than dried and …wait, how do you cook fresh pasta versus dried pasta?! Not to mention that once I got home and started cooking, I forgot to save the pasta water as I ALWAYS tend to do so I hope neighbors didn’t hear the screams of rage through my open kitchen window (luckily I realized halfway through pouring out the water so all was not lost). It turns out, I really just needed to stop panicking because this recipe’s charm is its simplicity and I was totally over-thinking it. A few final notes: do not eat the cheese off the plate as you’re grating it because you will discover that this is one of the best cheeses you have ever eaten (and I don’t even like hard cheeses like this!) and you will eat the whole wedge before finishing the recipe. Also, do not try eating the fresh spaghetti before you cook it because you will discover that it is so incredibly delicious and you will eat the whole bunch of it before finishing the recipe. Soft and doughy, it has the most amazing flavor and I think I could happily eat it fresh and uncooked for the rest of my life. That all said, if you don’t eat the ingredients beforehand and manage to actually cook dinner, you’ll have a great simple meal on your hands. If anyone will love this recipe, it’s my sister, who I can remember eating pasta with cheese sprinkled on it for as long as I can remember. Right off the bat, DO NOT fill a whole pot of water to boil the pasta (I say it because that’s exactly what I did). Put only 4 cups (1 quart) of water into a large pot, bring it to a boil. Add pasta and salt; cook stirring often (it may stick to itself in such low water), for about 5-7 minutes until al dente or your preferred doneness. Next important tip: DO NOT pour the pasta water into the sink. The whole reason we boiled the pasta in such a tiny amount of water is to make the water super starchy. Put a bowl in the sink, put a colander into the bowl, pour the pasta in into the colander. Shake the pasta a bit to make sure all the water is off and toss it back into the pot, leaving the water in the bowl. 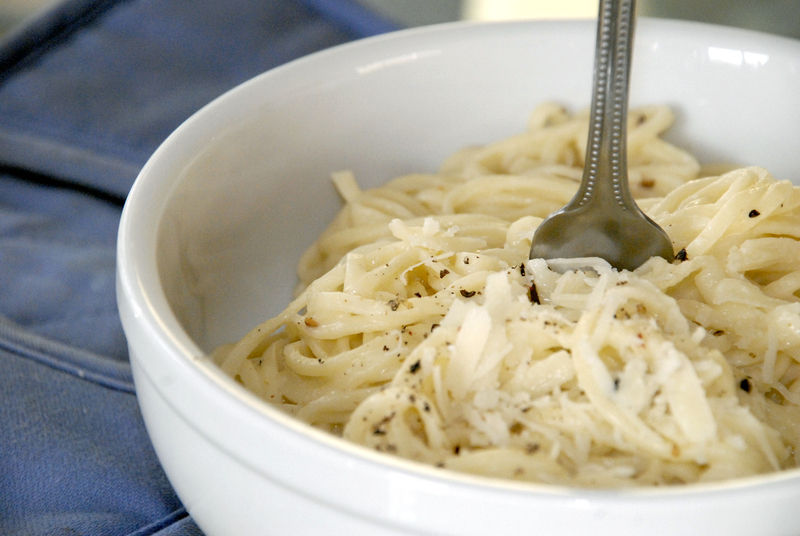 Put the 1 cup of grated pecorino romano into a small mixing bowl. Pour 1/2 cup of the pasta water over the pecorino romano and whisk slowly until smooth. Whisk the cream, oil, and black pepper into the melted cheese. Pour the cheese mixture over the warm pasta in the pot. Toss the pasta with the sauce and let it sit for 2 minutes to soak up the sauce, tossing the pasta a few times throughout the 2 minutes. If the sauce is too thick, use the leftover pasta water to thin it down a bit; just stirring it in until you have the desired consistency. Add an extra twist of the pepper grinder and the coarsely grated cheese–you won’t need even a sprinkle of salt, because the cheese is a great salty cheese, especially if you put a TON of it on top like I did tonight.